The most extensive documentation of Hamilton's religious beliefs and principles on the Internet. Hamilton's Religion As Seen Through His "Soul Ascending Into Bliss"
Works of Hamilton (ed. by H. C. Lodge) in 12 Vols. It has again been a long period of absence from blogging, and I have hardly written the promised series on Thomas DiLorenzo's Hamilton's Curse at all. My greatest apologies. After having introduced my argument and my standpoint in my introductory installment, I would like, in this post, to examine the theory itself. This post will look at what DiLorenzo himself says, and what he claims to be true. Please notice that I will be using DiLorenzo's own words to make my case; I will not base my argument on the words of reviewers and readers, whether they are admirers or opponents of DiLorenzo. Notice also that DiLorenzo's failure to faithfully apply this method to his presentation of Hamilton's views, will be shown to be a key weakness in his theory. Based on the Ninth Commandment, I am convinced that it is morally wrong to falsely accuse people, particularly godly people, of heinous crimes, without sufficient evidence and logic. By attacking Hamilton, and labeling him a "treacherous Founder," we discourage Americans to seriously peruse his writings, or the writings of other Federalists like John Jay or Fisher Ames. By ignoring the writings of these men, we ignore their sound wisdom and advice, and we miss out on their incredible insight into human nature, and how liberty can be preserved in a republic. The writings of Jefferson and Paine are poor substitutes, because the writings of those two men are tinctured (strongly, I might add) with the philosophy of humanistic individualism. This kind of philosophy is contrary to Christianity, contrary to federal republicanism, contrary to the spirit of law, and contrary to the spirit of the Constitution. We are left with a biased view of our nation's history, and we therefore fail to see that it is not monarchism or even mercantilism, but rather the philosophy of humanism, that sent our nation whirling down the drain to perdition, tyranny, and which ultimately will send us to our destruction. Let us now examine his claims. We will look at his argument, as if we did not really know the evidence -- if it pointed 'yea' or 'nay' -- to his claims. We will see how much sense the theory makes on its own, without any known evidence to the contrary, save general common knowledge. In subsequent posts, we will look at the evidence that deals with the case; but for now, we will let DiLorenzo speak for himself. Hamilton wanted to use this centralized power to subsidize business in particular, and the more affluent in general, so as to make them supportive of an ever-growing state. As treasury secretary, he was a frenetic tax-increaser and advocated government planning of the economy. He championed the accumulation of public debt, protectionist tariffs, and politically controlled banks; belittled politicians like Jefferson who spoke too much of liberty; and believed that the new American government should pursue the course of national and imperial glory, just like the British, French, and Spanish empires. ... [Jefferson] believed that interfering in the affairs of other nations for the sake of "imperial glory" [elsewhere, Dilorenzo claims that these words are Hamilton's] was a disastrous mistake. ... On another occasion [Jefferson] summed up his view even more succinctly: 'That government is best which governs least.' The motto of Hamilton, the consummate statist, might well have been "That government is best which governs most.'" [T]he triumph of Hamiltonianism has been mostly a curse on America. The political legacy of Alexander Hamilton reads like a catalog of the ills of modern government: an out-of-control, unaccountable, monopolistic bureacracy in Washington, D. C.; the demise of the Constitution as a restraint on the federal government's powers; the end of the idea that the citizens of the states should be the masters, rather than the servants, of their government; generations of activist judges who have eviscerated the constitutional protections of individual liberty in America; national debt; harmful protection international trade policies; corporate welfare (that is, the use of tax dollars to subsidize various politically connected businesses); and central economic planning and political control of the money supply, which have instigated boom-and-bust cycles in the economy. Here is, perhaps, the most astonishing implication of the theory: Hamilton accomplished all of this damage in his short lifetime, outnumbered by the other Founders who of course were liberty-lovers. He did all this as Secretary of the Treasury, and President Washington and the Congress (the same Congress which framed the Bill of Rights, including the Tenth Amendment) did little or nothing to stop him. 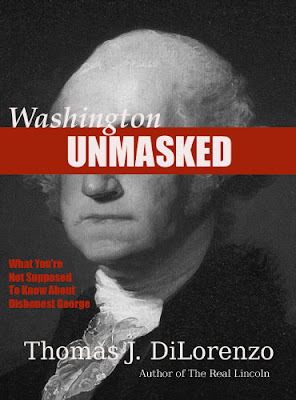 DiLorenzo would have us believe that Washington agreed with all of Hamilton's dangerous policies, out of blind trust. And that doesn't even deal with the issue of Congress approving Hamilton's policies. What are we to believe? That Washington and the framers of the Bill of Rights suddenly took stupid pills every morning of every day that Hamilton was in the Treasury??? Hamilton and his political compatriots, the Federalists, understood that a mercantilist empire is a very bad thing if you are on the paying end, as the colonists were. But if you are on the receiving end, that’s altogether different. So, DiLorenzo argues that Hamilton and his friends were on the “receiving end” of this arbitrary central governing system they created. We should expect that Hamilton, as being successful in his evil efforts (as DiLorenzo himself states), should have been made affluent and wealthy and powerful, and made his rich friends even more rich and powerful. Hamilton, according to the introduction of Hamilton's Curse, served a limitless ambition and thirst for power, and it was all because of him that we have the political and economic problems that we have today. He opposed liberty-lovers like Thomas Jefferson, and betrayed the American Revolution. Let's put this in some historical context. Hamilton comes on the scene of the American Founding, first as writing pamphlets in defense of the colonists against the tyrannical British government. He writes two pamphlets, “A Vindication of the Measures of the Continental Congress” (1774) and “The Farmer Refuted”(1775). In the latter, Hamilton makes the case, based mostly upon natural law, that the only just kind of government is the kind of government that is based upon the law of God (both natural and revealed) and upon the consent of the governed. He gives up the study of law, and forgoes graduating from Kings College (now Columbia) to join an artillery corps, which was one of the most well-trained and well-equipped units of the Continental Army until Baron Von Steuben (working with Hamilton) arrived and trained the troops. Hamilton risked his life (there are anecdotes of his close encounters with death throughout the war) in defense of America, his adopted country, on the fields of New York, Trenton, Princeton, and Yorktown. If it was ambition Hamilton sought, he no doubt would have chosen the easier road (who would have thought the American army would beat the British?) and become a Loyalist. The American War held little promise for a young penniless orphan with no relations in America, unless he was motivated by principle to share in the sufferings of his adopted country. And you cannot be motivated by principle if you are a power-hungry schemer. Jefferson, on the other hand, was not quite the dedicated revolutionary. Oh yes, he was an eloquent patriot, but when he was governor of Virginia, and the British came to arrest him and take the capital city, Richmond, he fled on horseback, and gave up the city without a fight. This action flung the gates wide open for the British to continue to march southward unimpeded, and continue their bloody warfare. General Washington was greatly disappointed and disgusted at the news, for he was relying upon Jefferson to afford the British some resistance. Patrick Henry, who had previously been governor, was so appalled at this act, that he urged Congress to declare Jefferson a coward. The motion was ultimately never successful, but this fact nevertheless marks Jefferson's character. And yet, we are to believe that Hamilton was the betrayer of the Revolution, and Jefferson, its unsuccessful defender. In the next post, we will continue to examine the "motive issue" upon which DiLorenzo's theory hinges. We will examine the little-known facts of history to discover just what Hamilton gained from his efforts, and if these facts coincide or contradict DiLorenzo's theory. From there, we will address the specifics of DiLorenzo's accusations. Today -- January 11 -- Alexander Hamilton was born. Based on his own claim that he was born in 1757, today marks his two hundred and fifty-second birthday! Huzzah! Although born over 200 years ago, his wise words speak directly to us today. Here is a little video I made last year, as a creative way to share some of those wise words. How Americans will need to heed them today! Tribute to Alexander Hamilton from hercmulligan on GodTube. P.S. I sincerely apologize for my tardiness in posting the second installment of my critique of Hamilton's Curse, by Thomas DiLorenzo. Progress on it is doing well, but it has required much note-taking and organizing. I hope to add it to this blog very, very soon. Please stay tuned! After an extended absence, I shall now resume the discussion of Alexander Hamilton's religion. In this installment on Hamilton's religion, we will focus singly upon Hamilton's marriage, which I believe will do much to point us to the true nature of Hamilton's religious convictions. It is generally well-known, that Elizabeth Schuyler, Hamilton's wife, was a very devout woman. It is also known that her character, morals, and activities savored of her strong Christian faith. There was not a person the most distantly acquainted with her, who was not aware of her firm and open faith. Even today, it is an undisputed fact. As mentioned in a previous post, one objection to Hamilton's orthodoxy has been founded on a portion of a letter that Hamilton wrote to Lt. Col. John Laurens, naming several of the qualifications his would-be wife should have. It has been claimed that Hamilton's words "as to religion, a moderate stock will satisfy me," and "she must believe in God and hate a saint" strongly indicate that his Christian faith had waned. However, that theory seems to be groundless when the fact that the one Hamilton married was not only an openly devout Christian, but she was nicknamed "the little saint" by one of Hamilton's friends (1), at about the time they were engaged. What an interesting irony! But to answer that, some have objected that the marriage was pure happenstance -- "you don't know who you might wind up marrying." In light of the facts of Hamilton's history, this is a very weak objection. First of all, in answer to this objection, must be noticed that Hamilton's general distrust of human nature often made him err on the side of being too careful in entrusting his affection and confidence in anyone. Hamilton knew the dangers of not being wise in marriage and in family. As a child, he experienced these dangers firsthand. Because he had neither the security of a moral mother nor a faithful father, Hamilton knew the pain of selfish and unwise choices in the family. He was determined, that if he started a family of his own, it would be entirely different from the makeshift family he had when young. He had learned from the mistakes of his parents, and was determined not to repeat them. In conclusion, then, it was not likely that he would be too careless in a selection of a wife. This argument is aided by the fact that sometime after Philip Schuyler had given Hamilton and Elizabeth Schuyler his permission to marry, Hamilton still was still cautious about rushing into decisions. As things stood, he was a penniless man, with nothing to offer their marriage other than a quiet and happy family life. On the other hand, she had been accustomed to comfort and security, and the luxuries that her aristocratic upbringing afforded her. Would she be willing to permanently say goodbye to those things, without envying her sisters and friends, who would doubtless marry into more wealth? Apparently, her answer was yes. 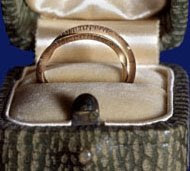 Above is a photo of Mrs. Hamilton's wedding ring, preserved at Columbia University Library. So the objection that their marriage was accidental or on a whim is hardly possible; Hamilton made every effort to avoid an unscrupulous decision. But the question that must then be asked is, what was the motive for marriage in the first place? The answer must be taken from Hamilton's own writings. Apparently, it was character that was most important to Hamilton. And it was apparent to all, that Elizabeth's virtues sprung directly out of her Christian faith. Again, this fact stands in opposition to the claim that when Hamilton married a devout Christian, he just didn't know what he was doing. But this brings up yet another question: What about Elizabeth Schuyler's choice? 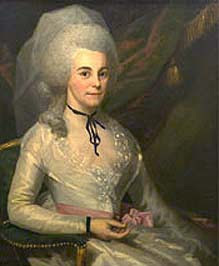 When most discuss Hamilton's faith in light of his marriage, the issue of Miss Schuyler's consent is rarely discussed. Her own Christian faith and convictions are obvious. Would she then marry someone unless she had good reason to believe that he shared her faith and virtue? I think not; it is highly improbable. She certainly did not gain much in any other way through the marriage; if anything, she willingly suffered the "loss" of the comforts of her youth. Why? Hamilton no doubt had several things standing in his favor. He was ambitious to excel in whatever he did, and he was a hard worker. He was bright, keen, perceptive, and talented. He was the favorite aide-de-camp of the venerated General Washington, and well-spoken of everywhere for his devotion and patriotism. Personally, he was affable, gracious, and winning; his warm smile and friendly manner won him friends quickly and usually for life. And, he had a very apparent love for children. But all these things were trifling extras when compared to his real qualities, which she recalled in later life as being "the elasticity of his mind, variety of his knowledge, playfulness of his wit, excellence of his heart, firmness, forbearance, virtues." (5) The little amount that she wrote, and the memoirs she left behind, show that she always believed that her husband shared her Christian faith. In summary of all that has been said so far, we must come to the conclusion that the evidence points strongly in favor of Hamilton's Christianity. We cannot prove with the evidence from that period that he was born again; however, such a claim can only be inferred in the study of any person. In this case, we have done only what any historian can do -- examine the evidence and determine whether or not someone professed the Christian faith, and lived up to their profession on a relatively consistent basis. So far, our examination of Alexander Hamilton has declared the answer to be affirmative. In the next installment, we will look at how Hamilton's Christian worldview went to work in the realm of law and politics. Note: This post is a brief interruption from my series of posts on Hamilton's religion, which series I promise to continue. Stay tuned for an update on that series, which will discuss Hamilton's wife, Elizabeth Schuyler, her faith, and how their relationship points to Hamilton's true religious convictions. I would like to thank my good friend Jean from Yeah, Right ... for pointing out this interesting piece of news to me. I thought it best that I deal with this subject here and now, while the book in question is still fresh on the shelves, and is likely to be a center of public attention. Well, it's official. 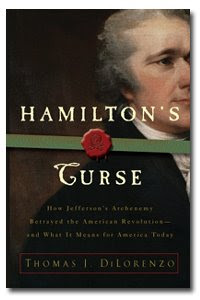 Thomas DiLorenzo's latest release, Hamilton's Curse: How Jefferson's Archenemy Betrayed the American Revolution, has hit the bookshelves during the past month. How timely it is that this book should arrive just when American citizens are still in shock at the recent bailout decision passed by the federal government. For this reason, DiLorenzo's book may give a greater springboard for those who blame big American government on Hamilton, to more effectively vocalize their view, and shape public opinion regarding the forces of good and evil at work in the Founding Era. I believe that the Constitution limits government, by expressly forbidding it to do certain things; however, it also widened the fence a little for the federal government, so that it would not feel obligated to over-leap the fence in times of crisis. Sometimes, cramped space can give anyone an excuse to jump over the fence. And once the fence is behind them, they are without any bounds at all. This is the argument that Hamilton and James Wilson made at the Constitutional Convention. I believe that our government has gone way to far from the limits of the Constitution, and has created for itself a new standard – the standard of administrative law. We are in effect, a government by man, and not a government of law. I do not believe that the Federal Reserve System, or central banking, huge national debt, etc., are good or useful, or healthy to our country. So this post is not meant to defend them. This phrase “strong central government” has been so often repeated in association with Hamilton during the 20th century, that it has become ingrained in us that this is what Hamilton wanted. However, Hamilton's own words stand to contradict the “just-so” notions we have accepted about his beliefs. First of all, it was not the fashion with Hamilton to refer to the federal government as a “central” government. He never referred to it as a central government, or that power needed to be “centralized.” He referred to the federal government as either “federal,” “national” (but that only as opposed to “state” governments), and even “general.” These terms that Hamilton faithfully used do not denote the same degree of political power as the term “strong central government,” which 20th century authors have, for all practical purposes, put into Hamilton's mouth. This is the whole issue that has never been argued or emphasized for some time. Until now, the argument that has taken place in broad public view has been “Was Hamilton or Jefferson right about the proper place of government?” The debate has rarely ever been “What did Hamilton and Jefferson really believe about government, and other issues like human nature and liberty?” Unfortunately, I think that DiLorenzo has focused on the “right or wrong” issue, without first insuring that the question of “what” -- which should be asked first before we can get the second question right – has been answered correctly. After having studied the Founder's writings for about 5 years, and Hamilton's and Jefferson's writings for slightly less than that, I have come to realize that Americans have not been taught the truth about our history, and that many of the “historical truths” that have been passed down to us through our public school classes, mainstream history textbooks, and popular documentaries, contain some fundamental errors. While there have definitely been some excellent things taught, and even authors who may often have some erroneous conclusions have at other times discerned other facts brilliantly, I have come to the conclusion that it is safer for Americans to trust the primary sources, and books which contain considerable selections from them. I hope that this series of posts will help to clear up some of the fog that has been cast over this issue, and that it will effectively shed the light of truth upon this discussion. A genuine New York patriot, with a personality just as eccentric as the name, who publicizes writings just as unique as the name, and who is as devoted to the cause of liberty as the Hercules Mulligan of 1776. Revival is Coming ... And So Is Opposition - Get Ready! - Found this via the great website SermonIndex.net. If Mexico is so bad, why are we letting them or others who have been there, elequontly allowed into the USA?